Rachel Rising (I’m gonna call if RR for the rest of this post) is a wonderful, independent comic series written and drawn by Terry Moore and I just love it! And one of the best things about it is that my wife also adores it, even more than I do I think. There aren’t that many series that we agree about or where she refuses to let me read the latest volume until she has done so even when I was the one who ordered and paid for the bloody thing! Anyway, RR recently concluded and, when I received the last volume, I started the entire run from the beginning again. It reads incredibly well this way but I had to wonder where Moore had found the time to do everything that he does on this book and release it in a reasonable schedule! It’s staggering how much of his work has gone into this one man show from the writing to the drawing and the covers (as well as, presumably, the editing). His work rate puts the rest of us to shame! If you like horror comics, or series that are a little different, ones that aren’t afraid to do unusual and epic stories, then you’ll like RR. If you’re a fan of creator-owned tales where the writer is free to cover whatever material they like and do with their characters as they wish, then read RR. As a writer of atheist fiction that explores ancient archetypes, I especially liked how Moore played with religious characters like Lucifer and Lilith and how the entire story tied into tales eons old. You may have to go a little out of your way to find RR as it’s not available at the usual online sources but you can find it on the Forbidden Planet website. Or you could, you know, go out and find your local comic store and support them instead. RR is well worth the effort! Now, I just need to meet Mr. Moore at a convention, get my trades signed (consider parting with more hard earned cash to get the hardcover) and get a convention sketch of Rachel or one of her co-stars and all will be right with the world. I look forward to it! My debut novel, ‘Only an atheist can help God save the world’, is available now from all electronic retailers. Also check out my other “Rambling” blogs posts for articles on being an indie author, comics, politics, and reviews of books and movies! Also follow me on Twitter @onlyanatheist1. Cheers! A few days ago was the one year anniversary of the day that I self-published ‘Only an atheist can help God save the world’ and so now seems like a good time for some thoughts, some reflection and for me to post an update for all that’s happened and that I have been doing since then. The first thing I should say is that I can’t believe that it’s been a year already! It has flown by, as it always seems to do, and what a fun ride it has been including getting some great reviews and appearing on a number of atheist podcasts. The sequel is also proceeding nicely, I’ll talk about this more below, as well as an interesting aside that happened in the past week. Anyway…onwards! The first thing I want to say is thank you to many people, from the guys and girls who first took a punt on my novel and were then kind enough to write reviews for my book (you all know who you are and how grateful I am to you! ), to those who invited me onto their podcasts for chats about atheism, politics and of course my novel. These people have all been remarkably generous with their time and I currently have ten reviews of the book, including three five star reviews, with an average of 4.3 stars out of five. That’s fantastic and you all have my thanks! As well as writing and appearing on podcasts, one of the other things I have also done this year has been to post as often as I can to this blog on everything from comics like ‘Rumble’ and ‘Mind Mgmt’ to reviewing non-fiction books like Johann Hari’s ‘Chasing the Scream’, George Monbiot’s ‘Captive State’ and many others. I’ve also written about my appearances on atheist podcasts, my recent experience of working in retail again after many years in science, and other random bits like my reviews of Star Wars: The Force Awakens and Captain America: Civil War. Basically, anything that’s caught my interest or that I love I’ve written about in the hope that I can persuade others to enjoy the things that I do. I also wanted to post an update as to the sequel to ‘Only an atheist can help God save the world’, ‘Jesus Returns: here he comes again’ which is again back in production now that I have been able to find some time to actually do some writing! I am having a blast working on this book, which is now more than halfway done, and I hope to finish it soon now that I have the time to do so (though the real possibility of a decent full-time job in the near future would make this more complicated!). Of course, once the writing is done, the editing process will begin and that often takes as long as the writing, so the release of this novel might be further in the future than I hope. But unlike when ‘Only an atheist’ was released (and I was more than a little apprehensive), I can’t wait for people to read ‘Jesus Returns’ so I certainly have the motivation to keep going! Finally, I wanted to end on an interesting note that also seems to warrant some discussion. My brother’s fiance is Australian and, on a recent trip back to her homeland, she sent me and my family an intriguing message. She said that she was having a conversation with a friend about atheists like Sam Harris, a fellow neuroscientist and author, and she happened to mention me and my novel (for it is always good to have friends and family willing to proselytise on your behalf). Then something interesting happened. It seemed that her friend had already heard of me and my book and had even seen the cover (which he thought looked like Socrates) but not via me, my twitter account or my appearances on atheist podcasts. There was a brief confusion where it seemed that Penn Jillette may have been the source of the information (I have since confirmed with him on Twitter that he was not) but nevertheless my brother’s fiance’s friend had heard about the book from somewhere, some podcast that was seemingly talking about it. And this is truly exciting for if people other than myself are now talking about and suggesting my novel to other people then suddenly it feels like this thing might be taking on a life of it’s own. I am aware that this could happen, that the novel might be found by the right person, someone with the right connections and then things could escalate. And even if this wasn’t that moment, I am still intrigued and I know that event still could happen and that is an exciting thought indeed! So if anyone knows of any podcast or outlet that is talking about my novel (without me as a guest), then please get in touch so that I can make contact with them directly. That would be very helpful. To sum up, it’s been an exciting year with some standout moments and I hope that the next one is as enjoyable. I’m hoping to finish ‘Jesus Returns’ in the near future and then the novel will be released when I am happy with it. Which will undoubtedly take some time! And then I’ll have to see what happens next in this series and whether or not it will continue (I’m already thinking of a sequel so it probably will). Hopefully the journey that I am on as an Indie author will and bigger things are to come. Here’s hoping! So, for my twentieth blog post, I thought I should actually ‘ramble’ about something that is directly relevant to the purpose of this blog and to the reason that I am on social media: the promotion of my novel ‘Only an atheist can help God save the world’. That is, after all, the main (but not the only) reason that I write this blog and why I am using Twitter, and having recently reviewed several non-fiction books, I realised that I really should try to post on relevant topics more often. This time I am talking about the pitfalls that indie authors like myself can fall into when using social media in an attempt to find an audience and to convince said audience to actually read the work that they have produced. For it is not an easy thing to do so here are my thoughts on how to do so with a little grace. Now, I am hardly an expert in the use of social media to promote your work, but I do feel that I have learned a thing or two since engaging with this medium and in the past few weeks I have had a few interesting exchanges that have increased my knowledge and actually changed the way that I have been using it. As many others do, but to a lesser extent, I follow accounts in the hope that they will follow me back and if they choose to do so, I then take the opportunity to tweet them an advert for my novel. So, I have carefully crafted this tweet to be upbeat and friendly and I have had far more positive responses to it than negative, but still it doesn’t always work out that way. On the positive, sometimes I will be told how stunning the cover is and that opens up a conversation nicely. But I do still I get the occasional bad reaction. One such reaction came when I tweeted at one of my followers and they responded immediately with an unpleasant retort and then blocked me. I thought that was more than a little harsh when a simple unfollow would have sufficed but what can you do? Another reaction occurred when I followed a fellow atheist, they followed me back, I tweeted my greeting and they expressed their annoyance at me ‘shilling’ my book to them. Now, this is not the only reason that I follow people, but it is the principal one, and I can hardly complain when I was doing exactly that. This person then asked me (somewhat indirectly) to unfollow them and I obliged for I am not trying to piss anyone off. Still, the exchange left a somewhat sour taste though I was still glad they didn’t block me. But it left me wondering how I could refine the way in which I use twitter and since then have I reduced the number of times per day that I send out my tweets about my book. So, I am again struck by the delicate balance that Indie, self-published authors like myself have to strike between advertising their works to their audience, and not pestering them too much and thus driving them away. I followed an author in the past few weeks whose time-line was an endless stream of thank you messages to their new followers that completely dominated my feed and so I quickly unfollowed them. But I am also aware that the time immediately after someone has followed you is the best chance to say hello, let them know about your novel and to show them the book cover. I know that my cover image is one of the best things that I have when seeking to advertise my book, along with short excerpts and highlighting the reviews that I have been given, and I know that I have a truly memorable cover, but the line between someone seeing this image enough times to snag their interest and being annoyed can be quite thin. And no matter how good your cover image is, your followers are likely to get tired of it eventually. I know that I would in their shoes. In the past few weeks I have also taken to trawling my list of people that I am following in an attempt to remove those who have recently chosen to unfollow me. I am still trying not to expand my following list too quickly and this allows me to remove those who no longer have an interest in my novel and replace them with others who might. I don’t blame those who do so as it must become tiresome following an author who is using Twitter for promotional purposes, and actually I am now more aware of how many times some of my followers must have seen my cover image, and so I am grateful to those who choose to stay. I recently noticed several of my followers had chosen to leave and I was very sad to lose a few of these accounts, including someone who is a tiny bit famous and who’s work I admire and who followed me despite having little reason to do so, but there is nothing you can do once they choose to leave. As ever with these things, you have to take the good with the bad and accept that you are using twitter for a purpose and that sometimes people you follow will not like what you are doing. I am aware that popular opinion writers for newspapers and magazines that I read have it far worse than I do (though I have received a little bit of that flack from time to time when tweeting about their articles) and I know that I have relatively little to complain about. I am also aware that this may change as more people read my book and I am still waiting for the day when someone religious reads a novel in which God comes to Earth and the only person who can help Him is an atheist. I am certain that it will happen and also that that will be an interesting day for I am very curious as to what they will make of it! Thank you to my followers, retweeters, and most importantly my readers and reviewers! Right, so, my book was self-published at the beginning of July 2015 and since then I have amassed a following of around 1300 people, most of whom I also follow. I am aware that I could’ve pursued this more quickly and aggressively, as I see other indie authors doing, by following many more accounts but to do so would be somewhat missing the point. I’ve tried to engage with as many of you as I can, though I have doubtlessly not done so with everyone, and I have enjoyed the majority of these interactions. In 7 months I’ve only had to block one account and have in turn been blocked by a small number, some of whom have turned out to be rather unpleasant characters, but at least one of which was down to my own stupidity. And being blocked by fellow atheists is quite a strange thing! There are lessons to be learned in the art of using social media to promote your novel and I feel I have learned them well! So, every time this happens, every time someone messages me to say that they have enjoyed my novel I get the feeling that this entire endeavour is worthwhile. I experience a small sense of satisfaction, and I know that, regardless of the number of books I have sold so far, I am glad that I am doing this. Then it happened again with one of my followers messaging me, someone who had previously told me that they thought my blog was “excellent”, to say that they had bought my book. Each time this occurs I am a little bit astonished and incredibly grateful. I am starting to get the feeling that I am getting somewhere, that this process is getting a little easier and that the next sale will be easier than the last. Yet I am not quite sure what has changed or why I feel like this and I shall have to have a think about it! Hopefully this feeling will continue and my sales will also do so! 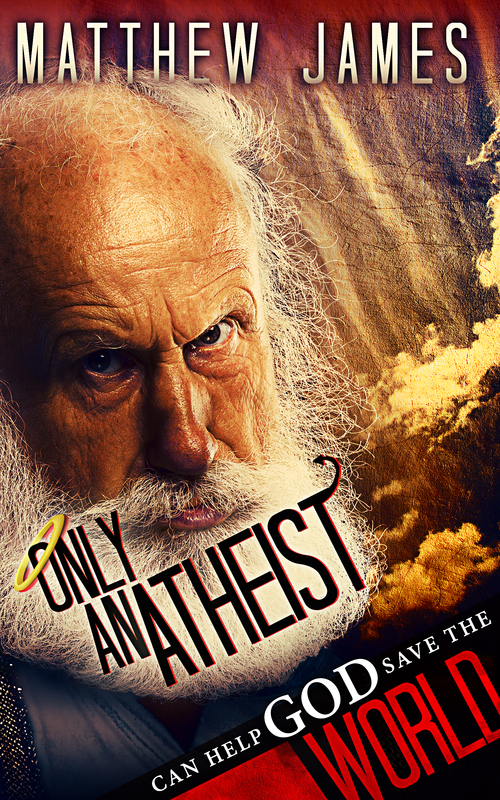 My debut novel, ‘Only an atheist can help God save the world’, is available now from all electronic retailers. Also check out my other “Rambling” blogs posts for articles on being an indie author, comics, politics, self-publishing! Also follow me on Twitter @onlyanatheist1. Cheers!